Dog Park Coming to Del Rey! 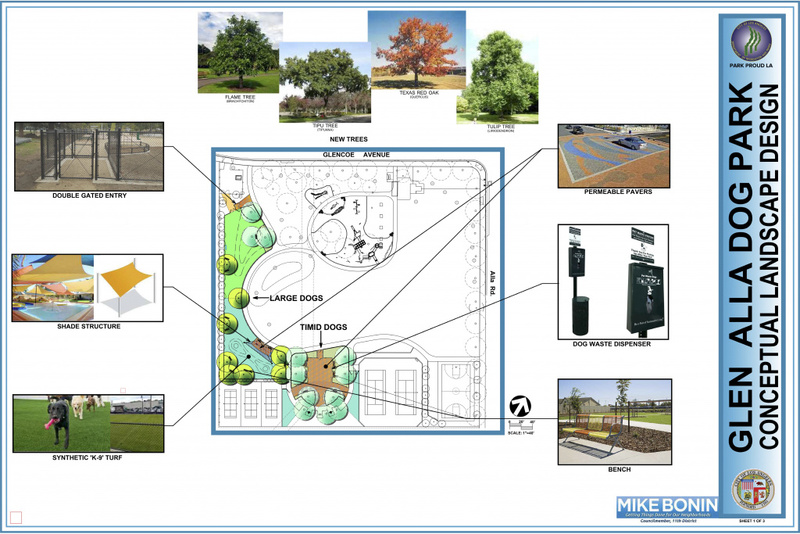 DEL REY – Residents of Del Rey have been clamoring or an off-leash dog park for their pets — and Councilmember Mike Bonin and the Del Rey Neighborhood Council are delivering. Bonin announced today that he has identified funding and the Department of Recreation & Parks is poised to move forward with an off-leash dog area at Glen Alla Park at Alla Road and Glencoe Avenue. The new off-leash dog park will repurpose areas of the existing park and include areas for both large dogs and smaller or more timid dogs, as well as benches, dog hydrating stations, trees, permeable pavement and dog waste dispensers. The new fenced-in area will incorporate design input from neighbors in Del Rey, preserve the playground and picnic areas, and will not affect the weekly Del Rey Farmers Market held at the park. Neighbors have been pushing for a dog park at the site for more than a decade, and the idea got a big boost from the Del Rey Neighborhood Council, which asked for Bonin’s help a couple years ago and began building additional grassroots support. In August, the Glen Alla Park Advisory Board voted to support the idea. The Del Rey Neighborhood Council and Del Rey Residents Association each voted to formally support the idea and the proposed design earlier this month. Bonin helped identify the funding and pushed the Department of Recreation & Parks to move forward. The Recreation & Parks Commission will formally consider the proposal in December, and construction is expected to start in February. 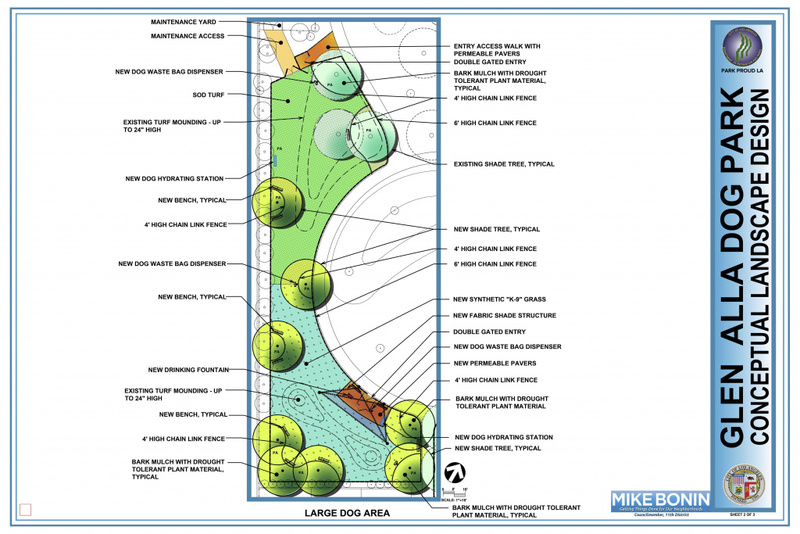 The department expects the dog park will open in late summer. 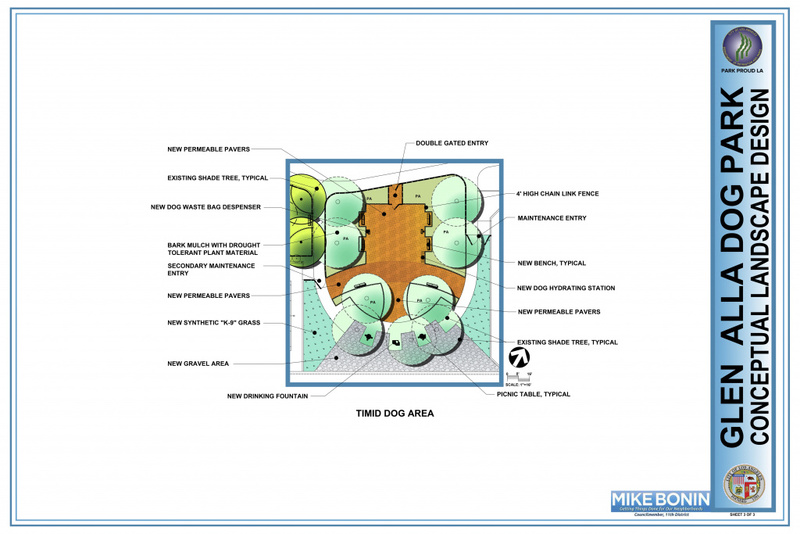 “This dog park will be a testament to what can happen when neighbors work together to create the community they want for their families, and for future generations,” Bonin added. In addition to applauding the addition of a dog park, neighbors also welcome the renovations the addition of the dog park will bring to Glen Alla Park. For more information about Councilmember Mike Bonin, please visit www.11thdistrict.com.